After 10 years absent, Red Star Belgrade FC will compete in the group stage of the UEFA Europa League in 2017. The 1991 European Cup winners have been able to overcome many obstacles and to make a breakthrough to the big stage. Since last appearing in the UEFA Europa League, the most popular club in Serbia went (and still goes) through the whole bunch of trouble. Without proper sponsorship and after various financial irregularities , the club has fallen into huge debts of nearly €50 million and even was kicked out from the UEFA competitions a couple of years ago. The financial situation is now somewhat better but the club still has a long journey to go before a return to the path of old glory. For example, the stadium desperately needs modernisation. The pitch is in awful condition even after being resurfaced a couple of years ago. The first team and Youth Academy facilities are in poor condition but despite that, Red Star continuously launches a lot of talented players each year. Sadly, the club is forced to sell them too early and below price, just to serve debts and to enable survival. Some of the latest hot prospects sold to the European big guns were Marko Grujic (to Liverpool) and Ilic brothers (to Manchester City). In the previous 10 years, Red Star was able to win a couple of trophies at the national level but at international stage team failed to impress, sometimes losing to total outsiders. Winning national trophies was scant consolation for the passionate and quite demanding fans as they wanted to see their club playing regularly at the high level. The situation was even worse after Red Star’s arch-rival Partizan managed to play in both UEFA Champions League and Europa League. Interestingly, both clubs qualified for Europa League this year and Belgrade will be the only city with two clubs in the competition. The situation looked almost unsolvable until this summer. Although the situation in the organisation and functioning of the club hasn’t improved, Red Star made a huge step forward. Before the start of the season, a new coach was hired. Former defender Vladan Milojevic was brought in to replace Miodrag Bozovic and he did a terrific job. Even after having too short a pre-season, he managed to build a solid team which was strengthened during the Europa League qualifying campaign. In the first qualifying round, Red Star was better than Floriana from Malta (3:0, 3:3). Performances in those two matches weren’t impressive but the goal was achieved. In the second round, the opponent was Irtysh FC from Kazakhstan. Red Star has a bad history against the clubs from the former USSR, so the fans were afraid of a new failure. However, the score in the first match in Kazakhstan was 1:1 while in the 2nd leg Red Star won 2:0. The first signs of optimism were seen among the fans and the whole team was resolute to continue improving. The next opponent was Sparta Prague. The famous Czech team immediately was considered as a favourite – they have a relatively big budget, Andrea Stramaccioni as a coach, and some well-known names in the squad. Those facts were enough to many to write off the Belgrade side. However, Red Star played two marvellous games in the 3rd qualifying round and won both – 2:0 in Belgrade and 1:0 in Prague. At that moment, appetite has grown as well as self-confidence. Everybody in and around the team was confident that Red Star can make a decisive step in Europa League qualifying, even after the final obstacle was Russian team Krasnodar which played in Europa League last 16 in the previous season. Red Star was beaten 3:2 in the turbulent first match in Russia. The 2nd leg in Belgrade was played in front of 50.000 ecstatic fans who finally could enjoy some success. Red Star won 2:1 and qualified for the Europa League. This success has an enormous importance to the club. Holes in the budget will be patched with the money from UEFA and will allow the club to breathe easier. 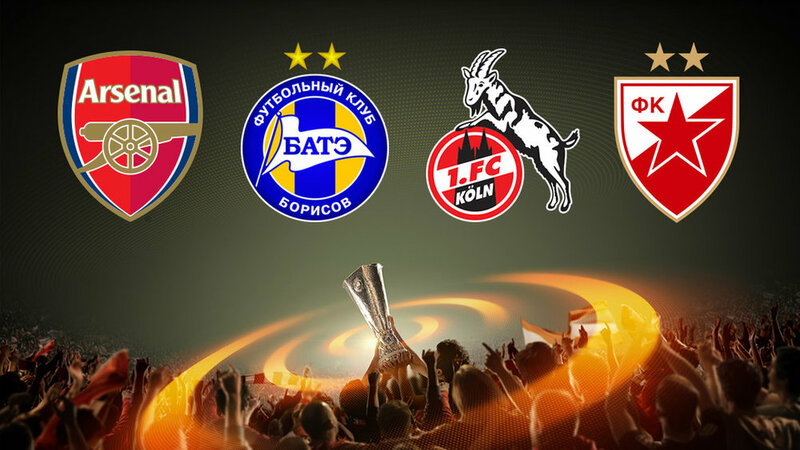 In the UEFA Europa League group H, Red Star will play against Arsenal, BATE Borisov and Cologne. Belgrade Red & Whites had nothing to lose as they are rightfully considered as outsiders but they have an opportunity to earn a lot, both on and off the pitch. Coach Milojevic has a squad of solid players. There is a group of players raised in the club’s Youth Academy (Vujadin Savic, Filip Stojkovic, Slavoljub Srnic), a group of internationals, including Guelor Kanga from Gabon, Canadian goalkeeper Milan Borjan, Mitchell Donald from the Netherlands, Richmond Boakye from Ghana, and once French hot-prospect Damien Le Tallec. There are also experienced players who played for the Serbian national team, like Nenad Milijas (ex Wolverhampton), newcomer Nenad Krsticic (Sampdoria, Bologna, Alaves), Aleksandar Pesic (Toulouse, Atalanta), Milan Rodic (Zenit, Krilya Sovietov) as well as some talented youngsters like Uros Racic and Luka Adzic. Don’t expect fireworks from this team but they are capable of making a surprise or two, especially in Belgrade. A painful decade should be behind the club and this season can be used as a solid foundation for the future. Finally, Red Star waits a long journey before being able to stand shoulder to shoulder with European giants. Undoubtedly, at this moment Red Star has a glorious history and a solid foundation for the new beginning. With enough knowledge and wisdom, that might be enough for optimism.